South Dakota Gov. Kristi Noem signed into law her first bill while as Governor. Senate Bill 47, which Noem signed on Thursday, will make it legal for South Dakota residents to carry a concealed handgun without a permit. Noem said she was “proud” have this be the first legislation she signed while in office as it will protect citizens’ Second Amendment rights. 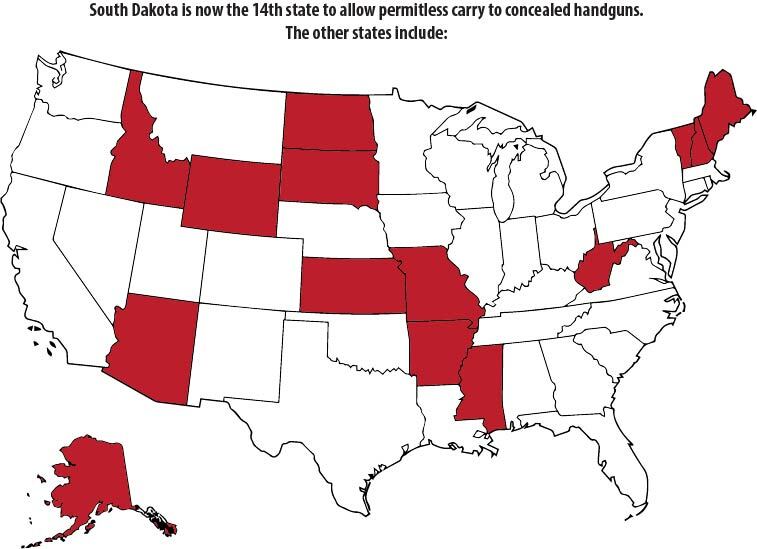 South Dakota is the most recent state to allow citizens to carry concealed handguns without permits. The other states are Alaska, Arizona, Arkansas, Idaho, Kansas, Maine, Mississippi, Missouri, New Hampshire, North Dakota, Vermont, West Virginia and Wyoming. 21 other states have proposed similar bills, but have been rejected as of now. The new law will go into effect on July 1, 2019. South Dakota citizens are already able to carry firearms openly without a permit. “This law is a common-sense measure that allows law-abiding South Dakotans to exercise their fundamental right to self-protection in the manner that best suits their needs,” Cox said. A recent poll conducted by Everytown For Gun Safety found that 84 percent of South Dakotans support required permits to carry a handgun in public, as do 85 percent of South Dakota gun owners. The poll surveyed 875 South Dakotans. According to an article by the Argus Leader, law enforcement did not support SB 47, but are in support of a bill that is currently under consideration in the house. This would restrict permitless concealed carry to South Dakota residents only. Supporters of the bills are calling it the push to “constitutional carry,” and says residents can still obtain permits if they feel that best suits them. Noem also said this bill will not change the restrictions of who can carry a concealed handgun. Besides SB 47, there are other bills still coming forward related to guns. If passed, SB 122 will ban higher education institutions ability to set regulations regarding students or faculty carrying or possessing firearms in the institution’s boundaries more than stated in the law. Lexi Kerzman is a sophomore studying Media & Journalism. She is originally from Bismarck, ND and is the News Editor for the Volante.